A full moon arched over the rolling hills of a small town near Lake of the Ozarks, Missouri on a clear evening in 1974. Under that moon, a crowd waited in anticipation for the glittering gold curtain before them to rise. Behind the shimmering curtain, the actors scurried to their places and the live animal portion of the cast made their voices heard over the din. The production was elaborate with a 50ft. x 30ft. stage; twin 25ft. lighting towers, balconies that sat in the large oak trees, a 40ft. half moon pond with three fountains and a concession stand that glowed within. “Summers Moonglo Theatre”, with over 30 actors and multiple live animals, was a very ambitious undertaking for the talented family that originated it in 1974. Not a dime was donated or a lottery won. Instead, ambition, determination, pure theatrical talent and a hard work were the capital forces behind Full Moon Productions. 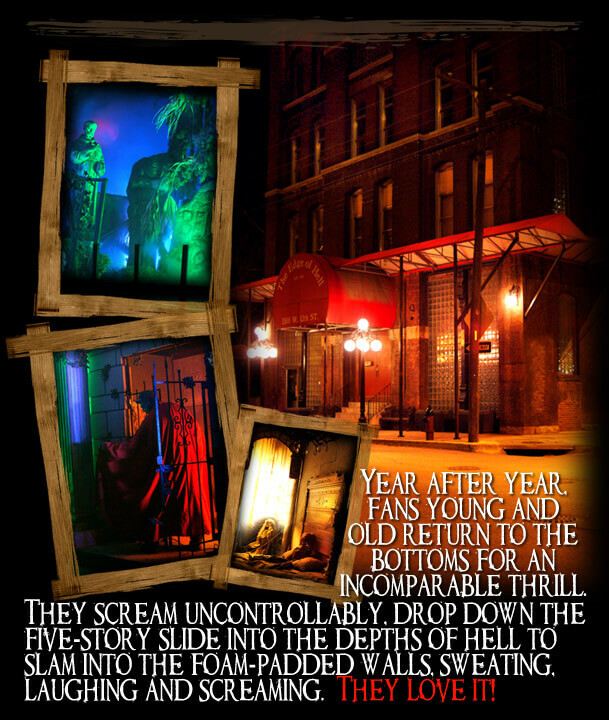 Looking for brighter lights, a bigger stage and an outlet for their collective talents, The Edge of Hell Haunted House was born in Kansas City, Missouri, just two and half hours from that small town in the Ozarks with a population of 132. This primal fear is punctuated by “Ratman” who scampers by seeming to bite the head off of a live rat. Entering into an early American sitting room with a piano, fireplace and ghost dancing, an intense thunderstorm instantly sweeps you into its power. The wind blows and the candles flicker as you wait to purchase your ticket. There is an eerie presence of a demon that possesses the grand staircase. Your chest is now pounding and screams are coming from all around you as the lightning strikes and your ticket is taken….for there is no return. A burning candle outlines Dracula’s crypt where he not only sleeps and protects himself from the sunlight but stores his half drained victims for feeding. A faint whispering is directing you forward and then you see poised and in front of you the world’s largest captive anaconda. Her belly is large with the latest prey she has captured and swallowed whole. However, her whispering forked tongue and lidless gaze draw you into a raptured state. Suddenly, a beautiful song captures your soul and hope is restored. A bright light stings the darkness and a glimpse of heaven reveals itself. The Ten Commandments are being recited and your life flashes before your eyes. The mind begs for forgiveness as the purgatory drains your inner ghost. Souls scream and cry begging to stay in heaven. But you are sucked into the vortex, a five story slide that takes you into the arms of the devil himself. Drained, you pass the devil’s den and into the dim light of the concession for the Edge of Hell, repentant and alive. Monty Summers is the owner/president of Full Moon Productions, which operates the Edge of Hell and The Beast every year from late August through Halloween. The haunting idea caught the heart and soul of this 14-year-old boy and after 30 years in the fright business, Monty continues to look for original ideas. “There are two things that make a haunted house,” says Monty in a recent interview, “a minimum of two stories and lots of realistic ghosts! Think about it, in all the stories, movies or books you saw growing up was it ever depicted as a haunted ranch?” He laughs and you have to agree with this theory. This man is sitting on the haunted house foundation of the world. In 1992, PM Magazine did a story on this family business and crowned Kansas City with this prestigious reign. Kansas City may be known for fountains but people travel from all over the world to visit this historic site. In 2003 a couple and entire wedding party traveled from Russia to perform their sacred vows on the “stairway to hell.” “We usually have a minimum of one wedding each year,” states Amber Arnett-Bequeaith, Vice President of Full Moon Productions. “After 30 seasons of family entertainment it brings us pure joy to hear the stories of grandparents bringing their grandchildren to experience our attraction.” According to Summers and Arnett-Bequeaith, safety has always been a priority. Computer technology now supports fire protection and internal customer monitoring, as staff track the activity of every guest within the haunted house at all times. City codes also require the company to have firefighters and police officers on duty during the hours of operation. Because parents feel so secure, many drop their children off, go for a peaceful dinner together and then come back to the area to pick up the kids. Now, the former landmark stockyards, warehouse and manufacturing district is transitioning into a family entertainment and business district. The West Bottoms also house Kemper and Hale Arenas, home to Kansas City’s American Royal, Comets, Wizards, regional concerts and more. Monty works with local businesses and neighbors promoting the area. He’s working hard on its rebirth by buying and renovating old buildings to house restaurants, office buildings and family entertainment. His vision of the district in the not so distant future is a bustling family entertainment and business district that rocks 365 days a year. In the beginning, the Edge of Hell was open just the week of Halloween. This year, both houses were open for more than ten weeks due to customer demand. “It gets in your blood!” opines Monty. However, haunted theater can be frightening business. The variables and risks of operation are many and imitations come and go every year. The financial capital requirements are intensive and poor weather, calendar nuances and heavy competition from other forms of entertainment can make or break your season. Another challenge is going from 8 full-time employees to 250 part-time for the season. Hiring and training is a very large part of the equation. In addition to being a significant seasonal employer, Full Moon Productions remains community and charity oriented. Each year they give multiple interviews, tours and tickets to regional college and high school students. Furthermore, every year a charity is chosen to receive a portion of the season’s profits. Last year the charity was “The Buckle-up America Foundation” in conjunction with former Kansas City Chiefs star, Neil Smith. Coming to a Hauntworld issue near you…The best haunted house in the entire WORLD “The Beast” also owned and operated by Monty Summers. It should be noted that ‘The Edge of Hell” and “The Beast” have never agreed to release their story to any industry magazine until now and only for Hauntworld Fans!!! Our next visit with Monty will unleash the ‘The Beast’ on the haunted house industry! Stay Tuned.